I'm doing some render texture work and I noticed a few apparent problems with the copyArea call in the Graphics class. Secondly, there are some strange inconsistencies. When you remove the green drawRect I have, the area copied by the copyArea becomes completely black in the destination. I played around with the GL_RGBA and GL_RGB texture format flags and that didn't seem to fix it, so I'm not sure what the issue is there. I'm not sure if it's some state that isn't set properly at some point or what.... some combinations of flush() also seem to cause the problem. // add outline. On my machine removing these lines causes the copyArea call to become entirely black. // Perhaps some openGL state that is set by the drawRect? No idea. // Draw the one we rendered to, then the copy in a new image. It seems I accidentally put this in the Resolved Bugs forum... I meant for it to be a bug report. Seems like I can't move it myself... could I ask a moderator to move it for me? I only have a suitable workaround: copyArea() seems to only work reliably with the default graphics object. You can get this with container.getGraphics(). There is no consequence for using this anywhere besides inside the render() method. Additionally, this eliminates having to create a back buffer so the benefit is two-fold. I can post some example code if you really need it. Otherwise, I can confirm that copyArea() is just plain weird in other circumstances. It was very frustrating when I experimented with it myself. Interesting info, thanks. I can give that a shot. I'm rendering to an offscreen image because I'm doing some expensive drawing that I'm saving to image to display later. I used that guide as well. Using the default graphics object instead of image.getGraphics() also avoids that delay the author complains about at the end. Have any luck with that? 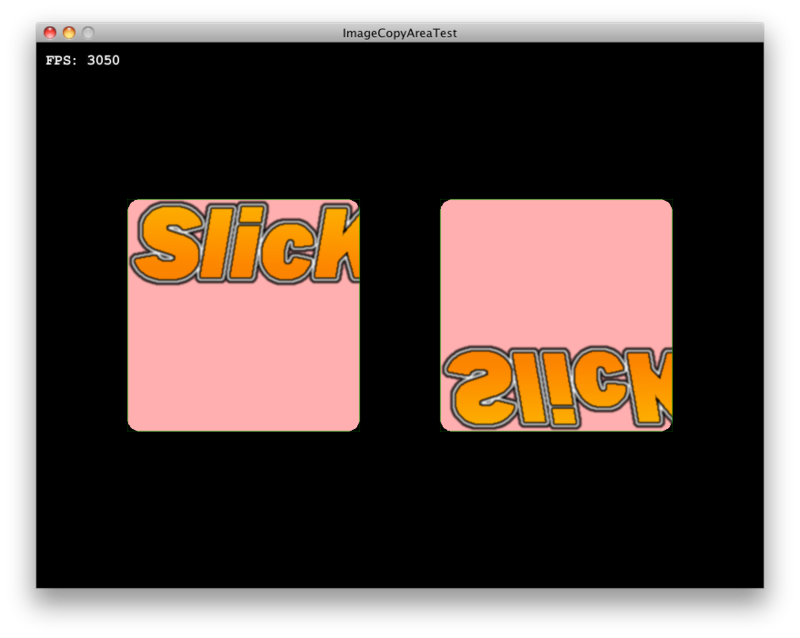 Yeah, using the default graphics context does work quite well. Thanks everyone for the suggestions. It feels a little weird, since I don't want this immediately on the screen, but as long as you clear after you are done doing your copyAreas, it's all the same anyway. It's spiffy, since things aren't even upside down, and it doesn't exhibit that strange behavior where it only works if you do the line drawing. Not the copyArea call, but drawing to the graphics context for the screen, instead of drawing to an offscreen graphics context. ...doesn't exhibit that strange behavior where it only works if you do the line drawing. Yeah, I gave up trying to do it the normal way when everything I did was translated, flipped, and colored the wrong way. I'm glad it's working out for you now! "The Keeper is aware. The Keeper understands. The Keeper has seen the enemy." I believe it's been brought to Kevin's attention. I linked to it in the status thread that he started. Hopefully it will be explained or fixed by his next bug run. Windows 7 x64, 4GB RAM DDR3, 3.3ghz AMD Athlon II X3 455, AMD Radeon HD 6800 series. no OpenGL expert or anything, but could it be a problem with inverse coordinates ?